« Rain or Shine, the Soccer Game Must Go On! 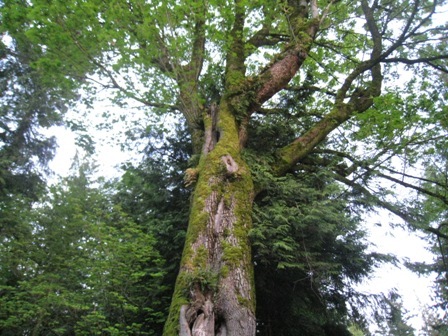 When I take our dog for her walk each evening, I usually stop to admire this old big leaf maple tree. I love the complicated textures of fern, moss, bark and leaves, and find the lines of the trunk interesting as well. This is currently my favorite tree, weird as that might be. I admire its beauty, and am satisfied. By the way, I took this photo at 8:30p.m. this evening, so you can see that longer days are definitely here. This was the first warm day so far this spring, long days notwithstanding. This entry was posted on Thursday, May 15th, 2008 at 9:48 pm	and is filed under Creative writing, Favorite Photos, Haiku. You can follow any responses to this entry through the RSS 2.0 feed. Both comments and pings are currently closed.